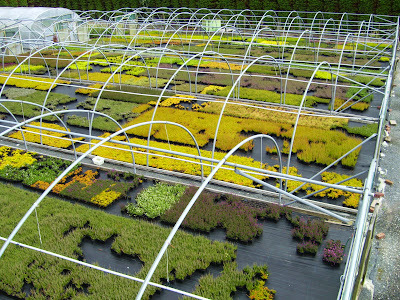 Here at Benson's Nurseries, we have been successfully propagating all our own cuttings for over 60 years. We specialise in Heather, Leylandii, Pieris,Dwarf Rhododendron,Evergreen Azalea and Dwarf Conifers.Available in a range of sizes 9cm to 5litre pots. The dedication, knowledge and enthusiasm of three generations ensures that we are able to produce top quality plants whilst keeping our prices extremely competitive. We would like to thank all our customers for their business, and give you our pledge, to continue providing you with the highest standard of product and service for many years to come. If you haven't tried us before, but would like to, then have a browse through this website, then please contact us and we will be pleased to provide you with the best service possible.